Annotations (or side-notes), which appeared in the wide margins. These contain "critical, explanatory, and suggestive notes" (as so described on the title page of the book). The majority of these are brief and include numerous cross-references. 198 Appendixes. These have been regarded as the most useful portion of the work and have even been published separately from the whole book. These are frequently referenced in the annotations (conveniently linked in the SwordSearcher edition of the commentary). They include essays and information such as The Divine Names and Titles, The Posterity of Cain, The Pharaohs of Genesis and Exodus, Figures of Speech, etc. Thanks to SwordSearcher's unique Bible margin linking system, The Appendixes can instantly be accessed by verse reference, in addition to topics and index number. 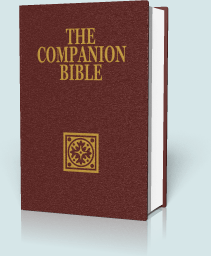 Although the Companion Bible now bears his name, E. W. Bullinger served as the primary editor of the text, not its sole author. It was completed and published after his death. It was originally printed in six parts, but became most popular in its single-volume form. 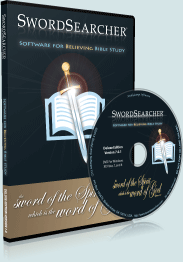 In SwordSearcher, the entire Companion Bible scripture commentary and appendix collection can be instantly searched for any word or phrase; is indexed by verse reference; and linked to each verse on which a comment appears.